Dale Thompson Builders, Goodier Baker Inc.
Scot’s Glen is a 55+ community in Columbia, Maryland. This charming active adult neighborhood offers a quiet setting consisting of low-maintenance homes available on a resale-only basis as well as a community center. A convenient location in Howard County with plenty of attractions nearby makes Scot’s Glen an ideal age-restricted community for the 55+ homebuyer. Active adults living in Scot’s Glen gather at the community center. The community center offers plenty of social space with a party room and meeting room where residents can host community events, board meetings, and other activities. Residents can also rent the community center for a fee for private functions such as birthday parties, anniversaries, and bridal showers. Homeowners can also enjoy the beautiful walking paths and natural open space in Scot’s Glen. They can go for a morning stroll or chat with neighbors outside on a sunny day. Dale Thompson Builders began construction of Scot’s Glen in 2006 and built 67 townhomes. Goodier Baker Inc. came into the community a few years later and bought the remaining lots to build six single-family homes and completed construction in the community by 2012. Scot's Glen consists of 73 residences available to homebuyers on a resale-only basis. The townhomes built by Dale Thompson Builders offer two-story living with master suites on the main floor. They have approximately 3,000 to just under 4,000 square feet of living space with three or four bedrooms, three-and-a-half to four bathrooms, and an attached two-car garage. Townhomes feature stone and brick facades, spacious brick patios, hardwood floors, formal dining rooms, and upper level lofts overlooking the first floor. There are six single-family homes built by Goodier Baker Inc. offering approximately 3,300 to 4,800 square feet of living space. They have four bedrooms, four bathrooms, and an attached two-car garage. These homes feature full basements, master suites on the main floor, gourmet kitchens, and plenty of storage space. Active adults in Scot’s Glen enjoy a low-maintenance lifestyle. The homeowners’ association fee (HOA) takes care of the hassles of exterior-home maintenance. The HOA fee also includes lawn maintenance, snow removal, road repair, and upkeep of the community center. With only 73 residences, Scot’s Glen provides a tight-knit community environment where neighbors build life-long friendships. Homeowners gather at the community center to plan activities and events. They also host book clubs, card nights, community meetings, and social events that are sure to keep them socially active every day. 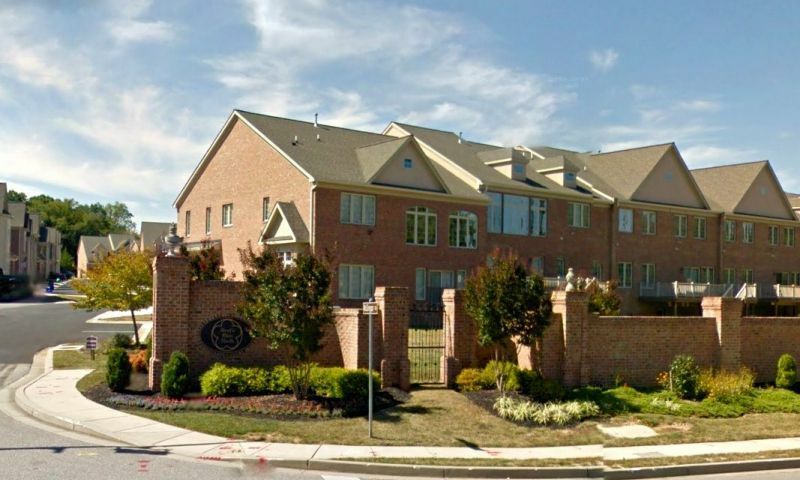 Scot’s Glen is ideally located in Columbia, MD. The area offers plenty of shopping, dining, and entertainment options nearby, such as the Hickory Ridge Village Center that’s down the road. It has a gas station, grocery store, bank, and many restaurants. The Mall in Columbia is also close by and provides more shopping, dining, and entertainment options as well as a movie theater. For outdoor fun, homeowners can head to Robinson Nature Center that’s only a five-minute drive away. Medical centers nearby include Howard County General Hospital, an affiliate of Johns Hopkins. Easy access to Highways 29 and 32 make getting around the city a breeze. The big-city of Baltimore is only half-an-hour away for more exciting opportunities for entertainment of all kinds. When residents want to travel farther, Baltimore-Washington International Airport is less than 30 minutes away. Scot’s Glen is a charming 55+ neighborhood that offers low-maintenance homes, a quiet community setting, and convenient access within Howard County, Maryland. There are plenty of activities available in Scot's Glen. Here is a sample of some of the clubs, activities and classes offered here. There are 67 townhomes in Scot's Glen that were built by Dale Thompson Builders. These attached homes offer two-story living with master suites on the main floor. They have approximately 3,000 to just under 4,000 square feet of living space with three or four bedrooms, three-and-a-half to four bathrooms, and an attached two-car garage. Please Note: Floor plans are not available at this time. There are six single-family homes within Scot's Glen that were built by Goodier Baker Inc. These detached residences offer approximately 3,300 to 4,800 square feet of living space. They have four bedrooms, four bathrooms, and an attached two-car garage. These homes feature full basements, master suites on the main floor, and plenty of storage space. Please Note: Floor plans are not available at this time. 55places.com is not affiliated with the developer(s) or homeowners association of Scot's Glen. The information you submit is distributed to a 55places.com Partner Agent, who is a licensed real estate agent. The information regarding Scot's Glen has not been verified or approved by the developer or homeowners association. Please verify all information prior to purchasing. 55places.com is not responsible for any errors regarding the information displayed on this website.